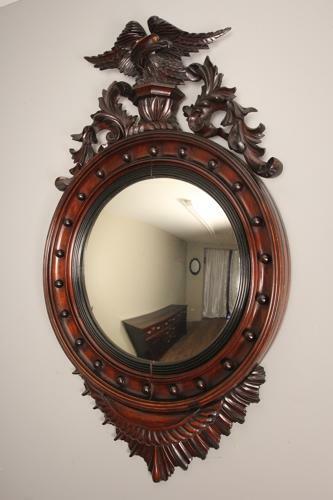 A superb example of a 19th century Walnut Convex Mirror. With a beautifully carved Eagle cresting complete with original glass eye, the surround with an ebonised inner surround with a moulded walnut frame and ball decoration, the base with fanned gadrooned carving. Retaining the original convex plate with superb colour and patina throughout the frame. English, Circa 1870.